I’m part of the science club at my school and a few days ago we went to Guelph University for a science competition. In one of the events that I was signed up for, contestants had to assemble a human foot using “clone bones” with the help of a diagram. Thirty or so bones were laid out in front of each team on a blue mat. My team was competing against three other teams. A few minutes before we began one of the volunteer supervisors asked everyone to put their phones in their pockets. Naturally, I misheard this as “put your bones in your pockets”. So, I did as I was told. I started taking the bones and putting them in my pockets. My group members stared at me in disbelief. They were so confused why I was placing bone replicas in my jeans! The supervisor walked up to me and asked me why I was taking the bones. I think she thought I was stealing them. I explained to her that I was just following her instructions. I didn’t even find the instructions strange since I thought everyone was going to put the bones in their pockets and take them out at the same time. That’s the only way the staff could guarantee that everyone started at the same time. My team members laughed at me and then we lost. At least we weren’t as bad as the team next to us, who gave up and instead of making a human foot decided to make a turkey-like creature out of replica bones. They made it a wattle (the red flap of skin under a turkey’s beak) out of plasticine. At least we didn’t come in last place, I guess. My day got more exciting later on though. The second story starts with a thirsty Ilan (yes, I refer to myself in the third person sometimes – in fact there was once a phase I went through when I always referred to myself as “the Ilan”). I deposited a toonie (that’s a Canadian two dollar coin) and a quarter into a vending machine. However, the machine thought I only put in twenty-five cents. I pressed the refund button but only twenty-five cents came out. The machine robbed me. I found someone who seemed as though they worked at the university and asked them what I could do. They directed me to the science office of the university. I found the office and walked through the glass doors. I turned a corner and continued to walk, trying to find someone. Eventually, I found a man sitting behind a computer. The door to his office was slightly ajar, and I spoke to him through the crack. When I explained to him what had happened, he laughed. Then he redirected me to the dean’s office. After I thanked him and left, I realized that he was the assistant dean of science. When I got to the dean’s office I saw the woman who first directed me to the science office. She found someone inside the office to help me. The lady, who turned out to either be the assistant dean of the university (or their secretary – I’m not entirely sure), grabbed her purse and reached for a toonie. Then, she asked me what I drink I wanted. After I told her that I wanted an iced tea, she walked to the staff fridge and took out a bottle and handed it to me. After that, she asked me if I wanted anything else to drink. I decided on a can of ginger ale after looking through the fridge. She handed it to me as well. I said thanks and left. Later D and A found me on campus and told me that they had found my toonie. It was in the machine. 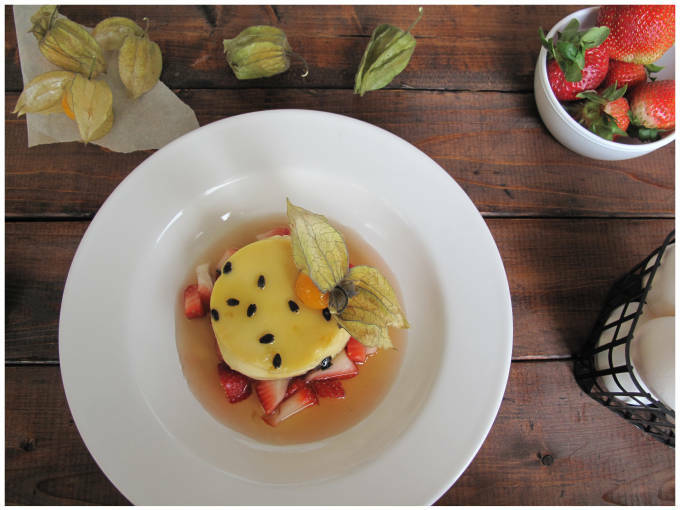 Passion fruit crème caramel with physalis fruit dipped in caramel and served over strawberries. 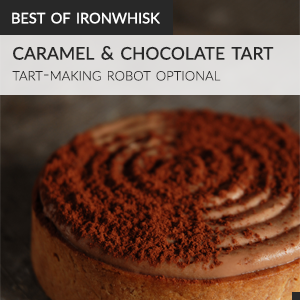 Served with passion fruit seeds and maple syrup. Adapted from Bridget Jones. Place the sugar in a heavy pan. Add the water and corn syrup and heat the mixture gently until the sugar has dissolved. Increase the heat and boil until the syrup turns a dark golden colour. Meanwhile, cut each passion fruit in half. Scoop out the seeds from the passion fruit into a sieve set over a bowl. Press the seeds against the sieve to extract all their juice. Spoon a few of the seeds into each of eight ramekins. Reserve the passion fruit juice. 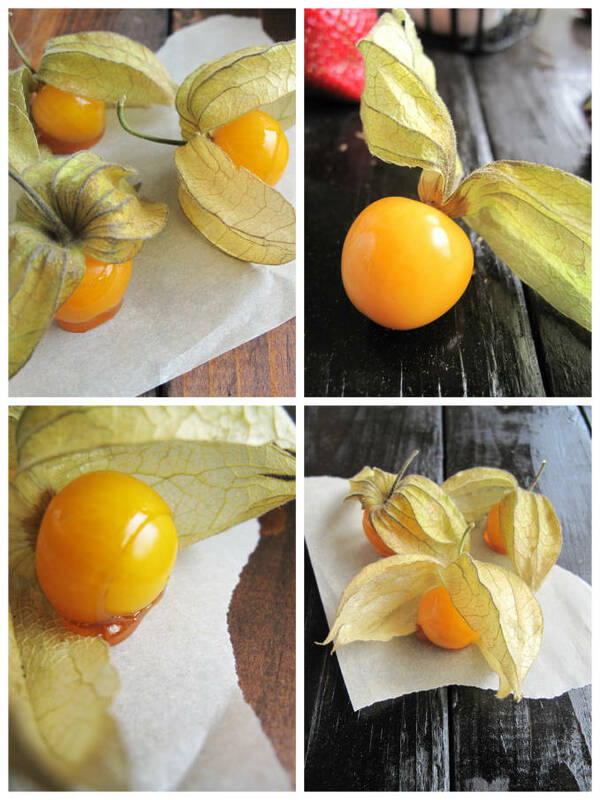 Peel back the papery casing from each physalis and dip the orange berries into the caramel. Place on a sheet of baking parchment and set aside. Pour the remaining caramel carefully into the ramekins. Preheat the oven to 300°F. Whisk the eggs, egg yolks, and the remaining sugar in a bowl. Whisk in the cream and milk, then the passion fruit juice. Straining through a sieve into each ramekin, then place the ramekins in a baking tin (pan). Pour in hot water to come halfway up the sides of the dishes and bake for 40-45 minutes, or until just set. Remove the custards from the tin and leave to cool, then cover and chill them for 4 hours before serving. 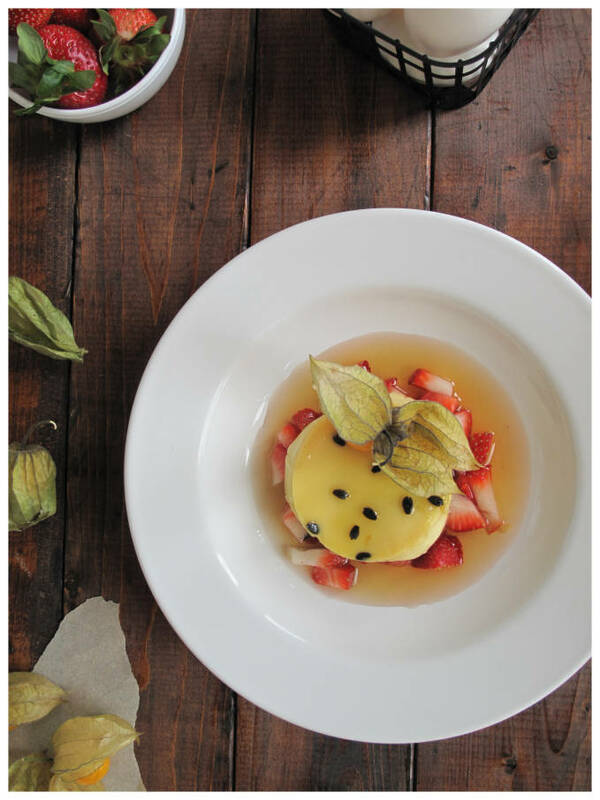 Run a knife between the edge of each ramekin and the custard and invert each, in turn, on to a dessert plate. 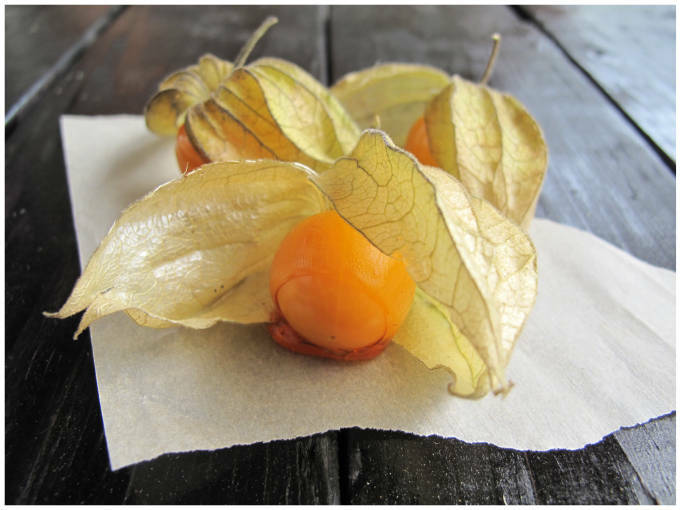 Shake the ramekins firmly to release the custards before lifting them off the desserts.. Decorate each with a dipped physalis. Feel free to pour some maple syrup on top or serve with strawberries. Putting the bones in your pocket sounds like something I would do by mistake. Too funny. 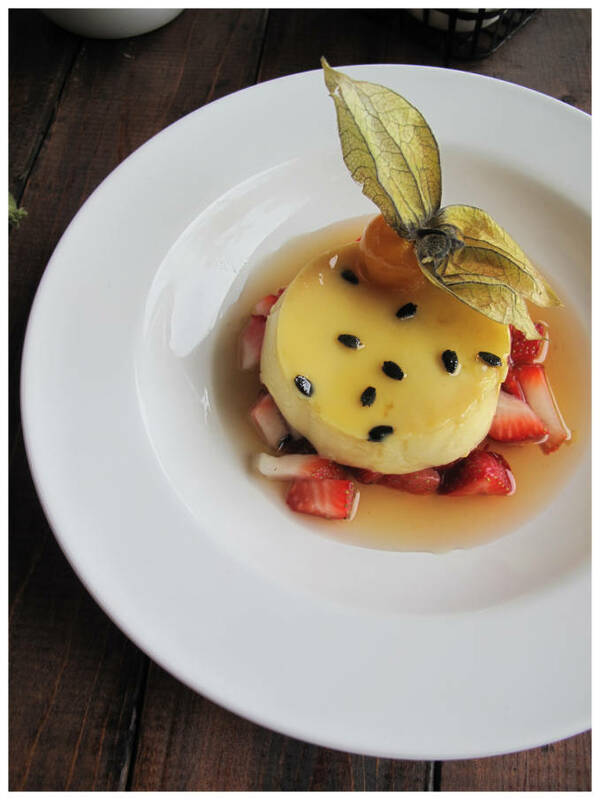 The passion-fruit creme caramel looks delicious! My day got more exciting later on though. The second story starts with a thirsty Ilan (yes, I refer to myself in the third person sometimes – in fact there was once a phase I went through when I always referred to myself as “the Ilan”).